VENICE, Fla. — In tears, feeling that all hope was lost, Bob Welter got a phone call that was too good to be true. 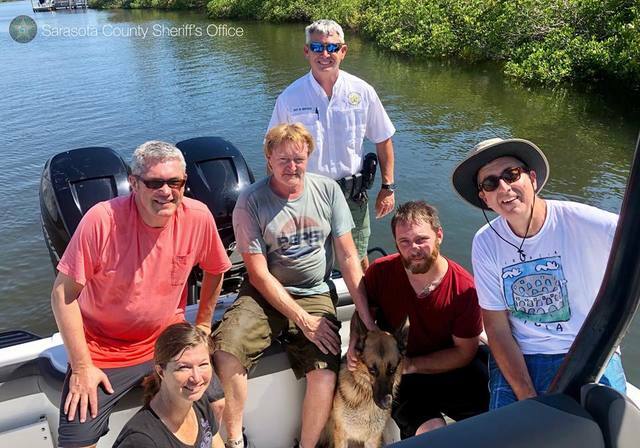 His 5-year-old German Shepard “Rex” was found swimming in the Intracoastal waters of Lemon Bay. Good Samaritan Kara Mullen said she saw Rex struggling in the water trying to swim towards the key. It was Monday around 10:30 a.m. She says immediately, she grabbed some ham and a kayak and tried coaxing the dog to shore. Mullen said Rex too “confused, scared, and exhausted” to know she was there to help. Mullen called animal control and within minutes the Sarasota County Sheriff’s Office responded with a boat and the helicopter. “It was amazing,” Mullen said. Two other Good Samaritans joined the rescue. Sarasota Marine Deputy Mike Watson coordinating the best way to wrangle the terrified dog off an island of mangroves. “He didn’t recognize my voice,” Rex’s owner Bob Welter said. Welter said his beloved dog escaped from his aunt’s home while the family was on vacation. He thought for sure he would never see his dog alive again. It took several hours to capture Rex. After traipsing through the thick mangroves trying to catch Rex the dog finally gave up. Welter’s son was about to grab him by the collar and then carry him to the boat. Welter said he couldn’t believe how compassionate everyone was. Especially deputy Watson. “What really took me to heart was the officer calling me that night he said 'by the way, if we didn’t get him while we were out there. I was going to stay out there til I found him.’ Believe it or not, we don’t have too many people like that,” Welter said. Rex’s paws are blistered and cut open from walking on shells and through oyster beds. He lost 10 pounds, is on antibiotics, and is having stomach issues, but should make a full recovery. Welter said his dog was having nightmares last night when they got him home so he slept on the floor with him. “He’s family. I had to comfort him,” Welter said. Welter said this week has been one he will never forget. Last Wednesday, he said his other 15-year-old German Shepard “Cubbie” died. He calls it a miracle that so many people cared enough to get Rex back home where he belongs.